Well, it seems that I’ll be doing two butterfly diaries this year after all. The Eastern Black Swallowtail (Papilio polyxenes), which I shall henceforth refer to as the EBS, favours as its larval host plants various members of the Apiaceae/Umbelliferae family. For most gardeners, this means carrots (including wild carrots, a.k.a. Queen Anne’s Lace, Daucus carota), dill (Anethum graveolens), rue (Ruta graveolens), and parsley (Petroselinum crispum). I’ve always found this rather ironic, because while the EBS is native to eastern North America, none of those plants I just listed is native. In my garden, the mother EBS are usually attracted to my carrot patch. However, I started my carrots late this year – over a month late – so I figured I wouldn’t get any EBS. Wrong. Apparently a single feathery five-foot-tall dill plant was more noticeable or more desirable (or both) to a mother EBS than two square metres of six-inch-tall carrot plants. (Yes I know I mix measurement systems. Deal.) The caterpillar I found today looks to be two or three days old, and I’ll make the guess of two days. Interestingly, from a couple experiments in past years, it seems that although the EBS has several host plants, the caterpillars prefer to eat whatever plant they first fed on. Here’s the little darling, on a bit of dill. 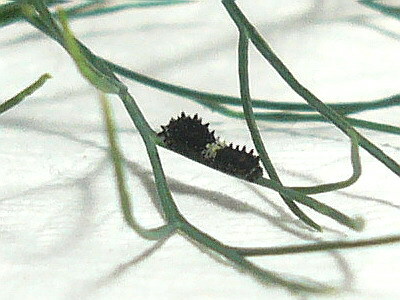 At this stage the EBS caterpillar is typical of swallowtail caterpillars on this side of the world: black with a white patch in the centre (called a saddle) and pretty knobby/spiky. The posture is also typical, wth the front segments held in a sort of hump. The overall impression is similar to a bird dropping. 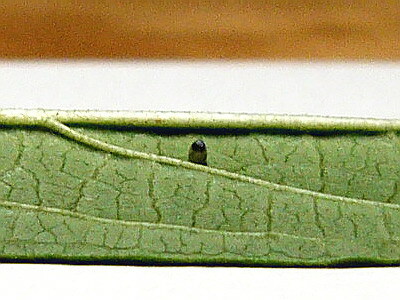 In some species, especially the more tropical ones, the caterpillar retains this disguise all the way, but the EBS doesn’t. 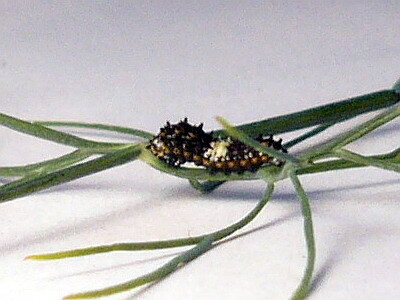 In a couple of instars it will turn light green with black and yellow markings. 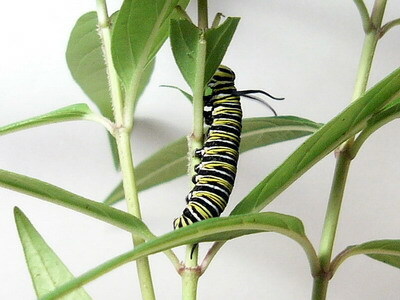 Here’s the monarch on Day 9. It’s still in the process of ecdysis. And here it is from today, Day 10. It’s well over an inch long now, and loves its food. It had just finished its last ecdysis, because I found its old face just underneath. I’m not kidding; at the beginning of moult the old face falls off and it walks out of its old skin. The old skin often gets eaten (depending on species), but I suppose the face is too tough, or falls out of reach. Hmmm…what else…OH YES! The jewelweed (Impatiens capensis) is flowering! I know it takes a special sort of mind to get excited about what is essentially a wild-growing weed, but the fact is I’ve wanted this plant in my garden for years now. And not just a few plants, but for it to maintain as a self-sustaining population (so I don’t have to go tramping through the woods gathering seeds [ethically!] every year, considering it’s an annual). That remains to be seen, but for now I’m thrilled. Thrilled. And the elderflower wine was delicious. Add another one to the (almost) black flower collection: Iris ‘Hello Darkness’, a “Tall Bearded” variety. This makes six and a half. I had tentatively hoped to grow it in a pot, but a bit of research tells me that bearded irises are the only group of irises that cannot successfully be grown in containers for long. Guess I need to dig a hole. I think every gardener has one or two plants that they desperately want to grow and just don’t seem to be able to keep no matter what they do, even when by all accounts they’re doing everything right. For me that’s turning out to be the native species of witch hazel (Hamamelis virginiana). I’ve tried twice. Some gardener, I can’t remember who, said to try everything three times before giving up: once is bad luck and twice is coincidence, but three times is confirmation. Or something like that. I suppose it’s worth a try. 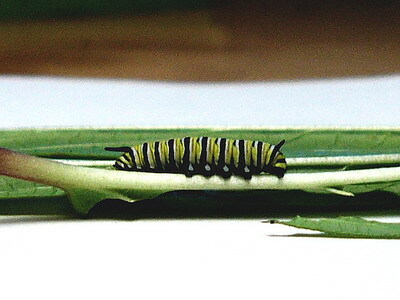 Here’s the monarch caterpillar on Day 7 (yesterday). Actually, this is the one that hatched a couple hours later than the one I’ve been showing so far. That one crawled up into the large vase I used to cover it in order to moult. Experience has sadly taught me that it’s not good to disturb a caterpillar during this stressful period, so I decided to leave it there and photograph this one instead, which obligingly began the process more accessibly. 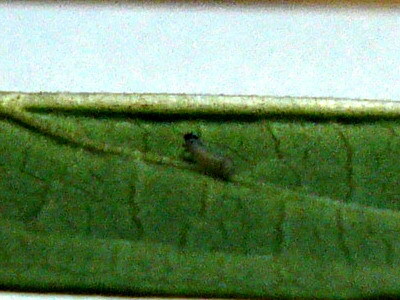 This marks the first ecdysis (moulting) into the second instar. For some gardeners, the most fulfilling aspect of gardening is raising plants from seed. 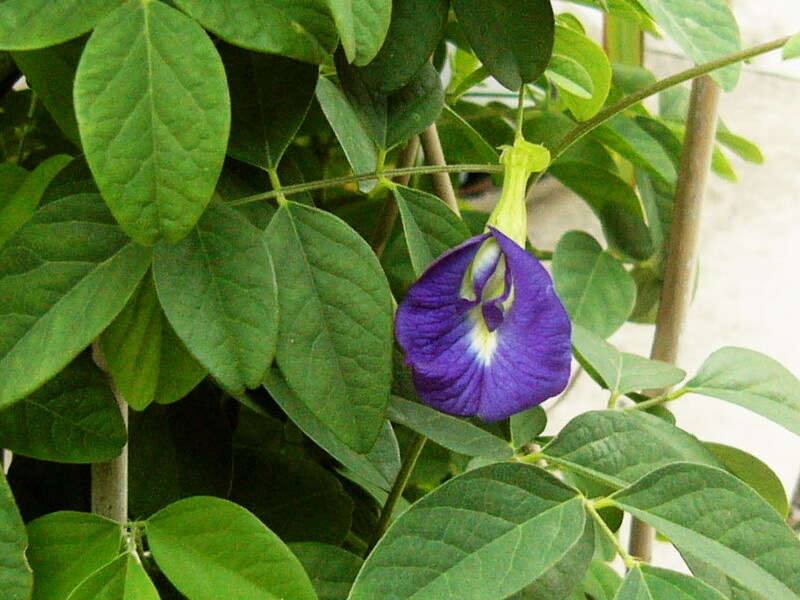 For others, it’s growing one’s own vegetables or fruit. For yet others, it’s getting things to the point where one can just sit in the garden and relax and look around with total satisfaction with the job done. 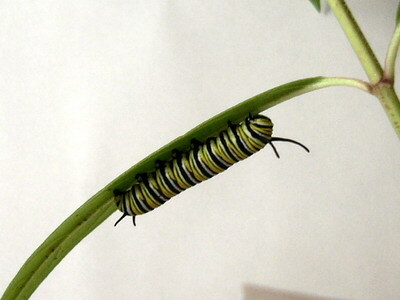 For me, it’s raising caterpillars into butterflies. The first time I did it, there was such a feeling of accomplishment, it was almost cathartic. All the things you read and see in textbooks suddenly come to life. Last year was a bad year for butterflies in general in these parts. I saw one Monarch butterfly (Danaus plexippus) in the garden all summer, and that was one more than most people did. I saw no Eastern Black Swallowtails (Papilio polyxenes), which I also usually get a lot of. Predictably of course, the one butterfly that did make its regular showing was the unwanted, unwelcome, and pestiferous Cabbage White (Pieris rapae). Lepidoptera non grata. Last summer I raised no butterflies because I simply didn’t find any eggs (other than the Cabbage Whites, which I crushed). Better luck this year. 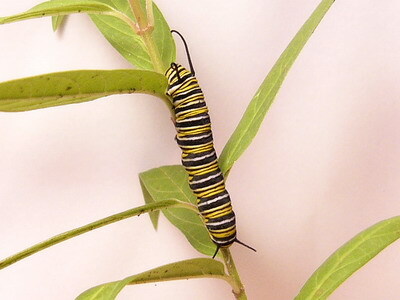 I saw a Monarch visiting my milkweed patch several days ago and collected some eggs. In so doing, I found that she wasn’t the first in the garden, because at the same time I found a newly hatched caterpillar. So this year, because I have this blog, I think I’ll run a Monarch diary, complete with poorly taken, grainy pictures (my photography skills are lacking to say the least, and my camera isn’t the best at macros). Considering the day this egg was laid as Day 0 (which was Monday July 14th), this is the egg on Day 2. 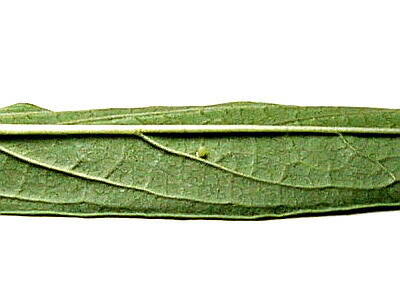 When just laid, the eggs are white-cream, and turn slightly yellow as the days pass. 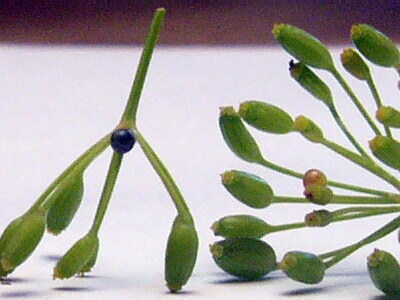 Just before the egg hatches, a black spot appears at the top of the egg. This is the head of the caterpillar. By inference, this means the eggshell is transparent, or almost so, at this point. Horrible picture, I know, taken roughly seven and a half hours after the last one. The egg hatched very early on Day 5. 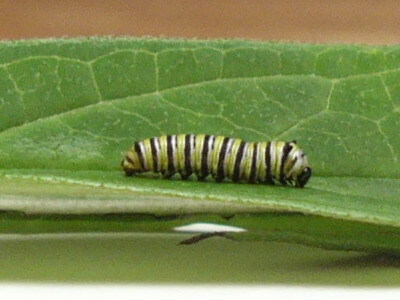 Like many butterfly species, Monarch caterpillars eat the eggshell upon hatching. That’s what this one is doing. It is barely 2 millimetres long. 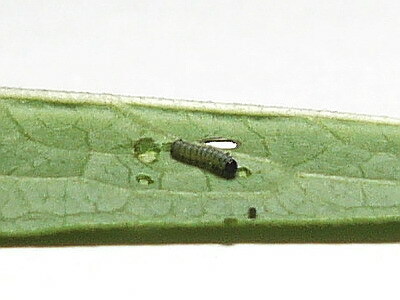 The same caterpillar, twelve hours later. Believe it or not, it has almost doubled in length, and the body is beginning to show the pattern of stripes that will later turn into bands of white, yellow, and black. At the bottom of the leaf you can see a bit of frass, which is a highly scientific, technical term that means caterpillar droppings (and sometimes insect crap in general). More to come as this guy grows. 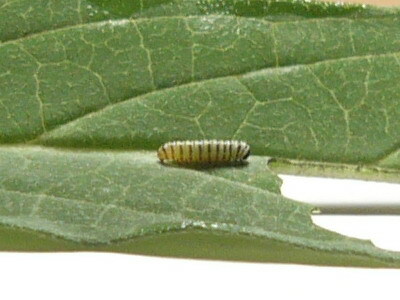 Currently I have one caterpillar older by several days, this one and another at the same stage of development, and one unhatched egg. I’ll do another check of the plants to see if I can find more eggs tomorrow or the next day. Not that I’m complaining, but so far this has been a pleasantly wet summer. In case you get the wrong idea, a wet summer in this area is if it rains once a week. Some summers (such as the past two), there’s not a drop of rain for six weeks, but somehow it manages to be hellishly humid. I almost feel spoilt this year. First hummingbird of the season today! Only glimpsed it; for a moment I thought it was a dragonfly. As usual it was the bee balm (Monarda didyma) that drew it. Sometimes I even impress myself. Somehow, I don’t know how, one of the potted turmeric (Cucurmis longa) plants is about to flower. Earlier, about the end of April, one of the aloe (Aloe vera) plants flowered. I must be taking better care of them than I thought. Was at the Master Gardener potluck last night. Ate too much. Must remember to find that recipe for bacon jam. Not too much else going on in the garden right now; just the usual summer maintenance. The Nicotiana ‘Chocolate Smoke’ seedlings are about ready to plant out. I started those really late, so I hope they have enough time to bloom. Oh, and I harvested some of the garlic today.